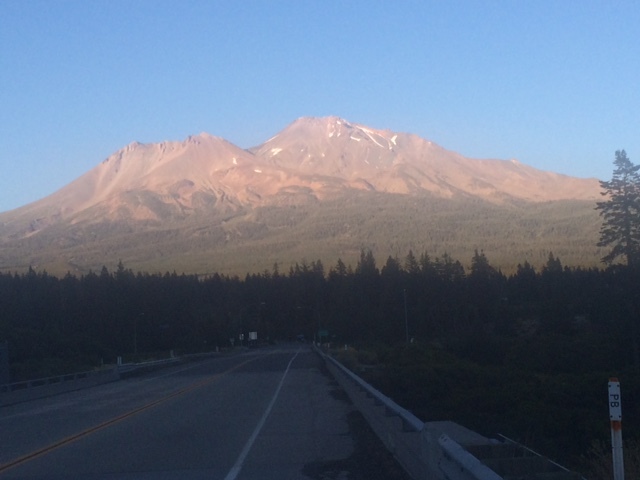 Trip Log – Day 140 – Ashland, OR to Mount Shasta, CA | How Will We Live Tomorrow? Today was a strenuous reminder of cycling’s rigor. It’s been some time since I rode over eighty miles or a mile of vertical climb. Today I had both. The Rogue River Valley over Ashland was shrouded in clouds when I began my long slog up and out. Like most, the valley runs north/south. But the Siskiyou Mountains, the only range in the West that runs East/West, cut the valley short, leaving Ashland in a bowl that empties to the north. After fifteen miles, and more than two hours of pedaling, I joined I-5 within a mile of that Interstate’s highest point. It’s an unpleasant place for a cyclist. The fog was dense, the shoulder as wide as the road, but many trucks pulled over to check their brakes before the descent. Within a minute, literally, of rolling downhill, the fog lifted and the skies were crystal blue. Welcome back to California! I had to remain on I-5 for twelve miles, through the ritual produce checkpoint, until I reached the Klamath River Parkway. 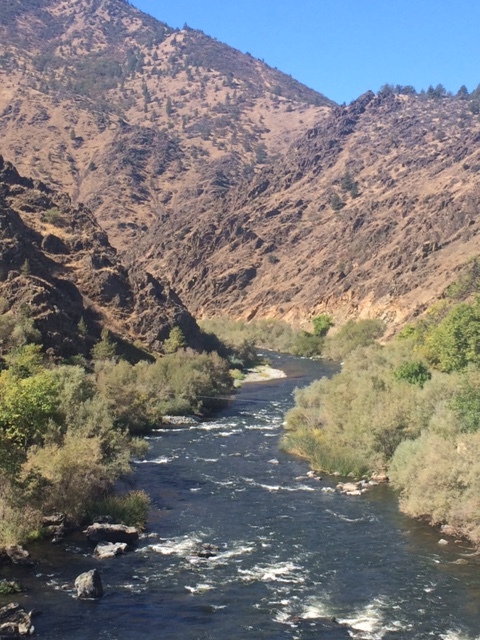 The ride between the Klamath River and Yreka is spectacular. 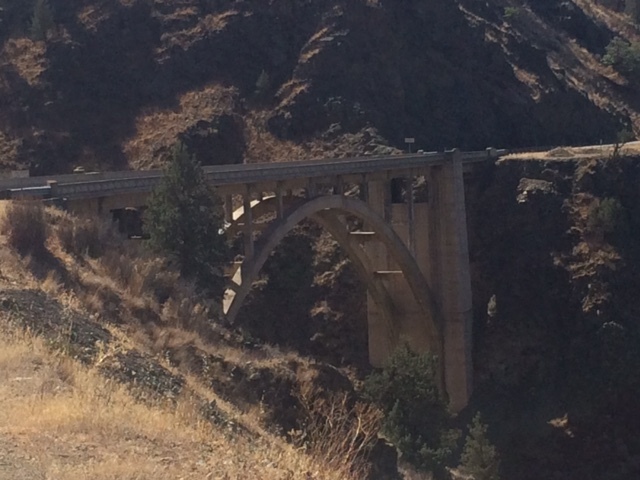 The road was built in the 1930’s, with graceful, narrow bridges high above the Shasta River. About halfway through I caught my first glimpse of Mount Shasta, framed between two hills with its namesake river running beneath me. It looked so tiny in the camera frame. Little did I know that it was over fifty miles away and would just grow bigger as the day progressed. 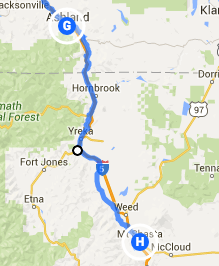 I stopped for lunch in Yreka, the epcienter of the independent State of Jefferson movement. Signs for ‘No Monument’ and ‘No Dam Removal’ were everywhere. It’s not clear why back to the earther’s don’t want a Klamath River National Monument designation or local dams removed so they can run free again. Then again, they don’t want to be part of California; they don’t want to be part of the United States. They are just much better at ‘No’ than anything ‘Yes’. Does that attitude have anything to do with why I went to three eateries for lunch before I found one that took my order? Kitchen folks in the first two simply didn’t bother to come out as I stood at the counter. No matter, the third place had tasty burritos. 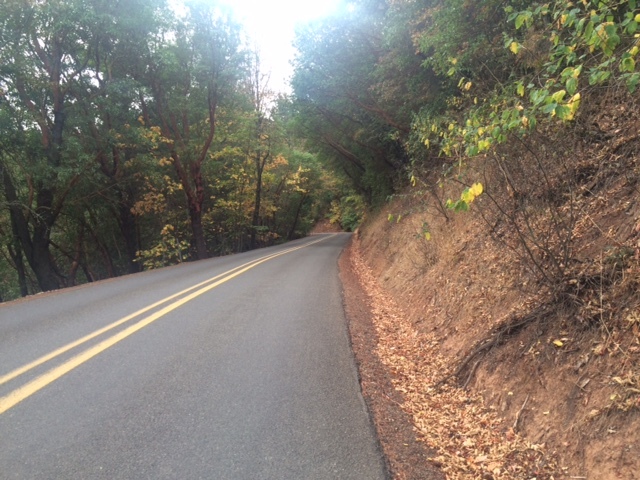 I left Yreka and made my way along tranquil country roads just beyond earshot of I-5. 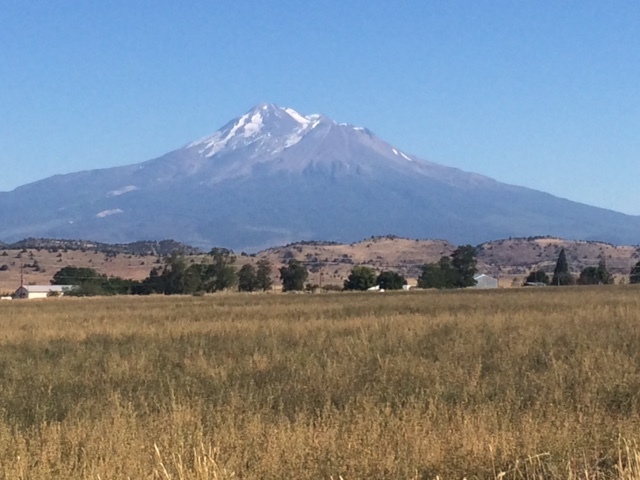 Mount Shasta evolved from an occasional presence to a fixed point. Problem was, I never seemed to move in relation to the mountain. The winds picked up, the grade tilted, and I worked hard, but my perspective on the mountain never changed. Of course it did, just not as quickly or as easily as I might have liked. That’s when cycling is like yoga. So I took a break, breathed deep, fixed my attitude, and pedaled on. 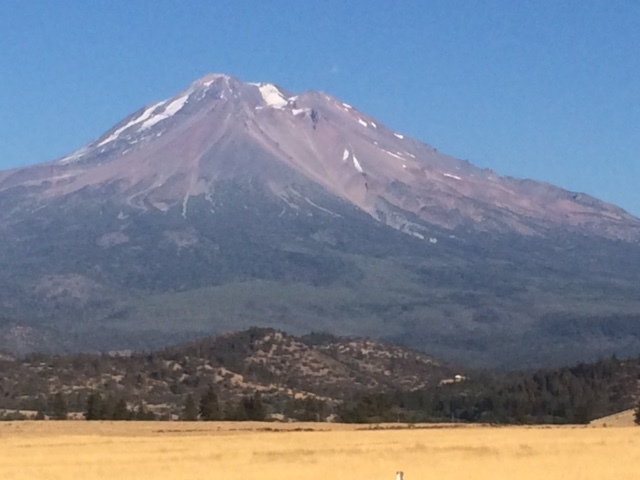 Finally, after moving toward the mountain for hours, I began to move around it, to approach the City of Mount Shasta. It was almost seven when I arrived at my warmshowers host. The pain of the day scrubbed away with the grime on my shins. By the time I sat to dinner, it seemed fortuitous that the mountain chose to be such a constant presence. 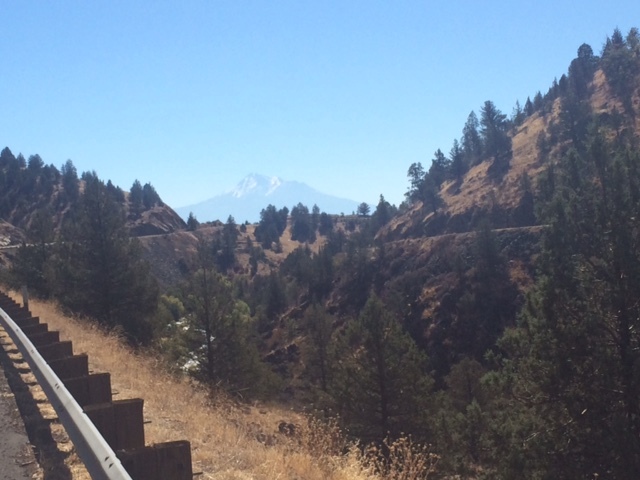 This entry was posted in Bicycle Trip Log and tagged Ashland OR, City of Mount Shasta, I-5, Mount Shasta, Shasta River, State of Jefferson, Yreka CA. Bookmark the permalink.